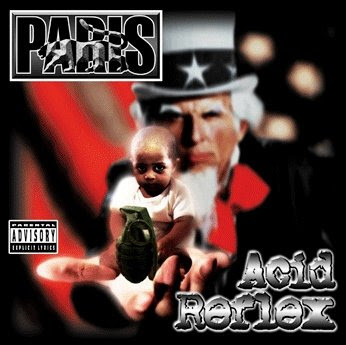 San Francisco, CA - Bay Area rapper/activist Paris is preparing to release his latest album, Acid Reflex, on September 9th on his own Guerrilla Funk Recordings and Filmworks, LLC, distributed by Fontana/Universal. The rapper's first single, "Don't Stop the Movement," features newcomer T-K.A.S.H. and will be released early August. The album comes just in time for election year and contains commentary on a wide range of topics including black-on-black crime and violence, the ongoing problem of police brutality, war, politics and what Paris calls "the need for more of an equal balance between positive and negative influences in entertainment." Acid Reflex is the latest installment of cutting-edge funk-and-rock-inspired hip-hop in a career spanning the sale of over 3.8 million units independently worldwide. It features performances by Rock and Roll Hall of Fame Inductee and Parliament/Funkadelic frontman George "Dr. Funkenstein" Clinton, Public Enemy leader Chuck D and Paris-protégé T-K.A.S.H. "There's no time like the present to speak out on issues and use the most popular form of musical entertainment to motivate and inform," says Paris, a seasoned multi-instrumentalist who also serves as the album's producer. "That's why I decided to call the album Acid Reflex - it's an aggressive response to what I see going on. There are a lot of people out there who feel like mainstream music doesn't truly reflect their concerns or how they feel. Our art form is being kept artificially young and artificially dumb. Listeners of all ages are noticing that there's more to what we do than what's given us on the radio and on t.v." In other news, Paris has expanded his Guerrilla Funk brand to include a film division, with projects slated for release with featured contributions from multi-platinum Grammy™ award winner Common, multi-platinum Grammy™ award winner André 3000, multi-platinum Grammy™ award winners The Dixie Chicks, Talib Kweli, Public Enemy, George Clinton, The Coup, NOFX, Michael Franti, Anti-Flag and Tom Morello, among others.